How y’all doing, forex buddies? As expected, the Bank of Canada (BOC) decided to maintain the overnight rate at 0.50%, but the Loonie ultimately got the stuffing beaten out of it. What gives, yo? Here are 4 key points from the most recent BOC rate decision that very likely convinced forex traders to bail out of their Loonie longs. 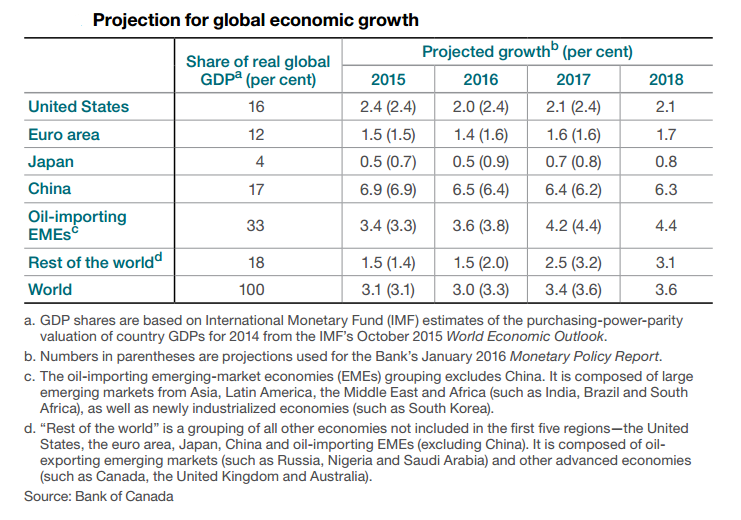 As noted in its April Monetary Policy Report and as shown in the table below, the BOC downgraded its global growth projections for 2016 from 3.3% to 3.0%. 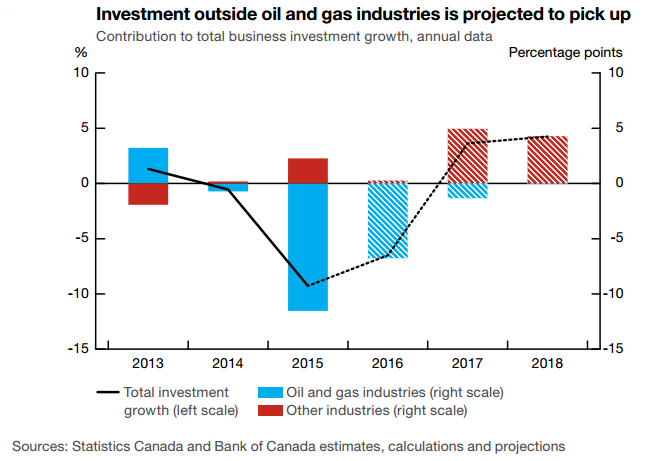 The lower investment in the oil and gas sector, in particular, is pretty bad for Canada since that is one of the “key sources of demand for Canadian exports.” In addition, the projections for residential investment in the U.S. was also downgraded because there is a “shift in US housing construction toward multiple-unit housing, which is less investment-intensive” and would also mean less demand for Canadian lumber. To sum it all up, the slower rate of projected global growth, particularly in the U.S., would lead to lower demand for Canadian exports, which is pretty nasty for an export-driven economy like Canada. In its official press release, the BOC estimates that Q1 2016 GDP growth was “unexpectedly strong,” but that was because of “temporary factors,” so GDP growth is expected to moderate in Q2 2016, as those “temporary factors” fade away and business investment continues to decline, particularly in the resource sector. 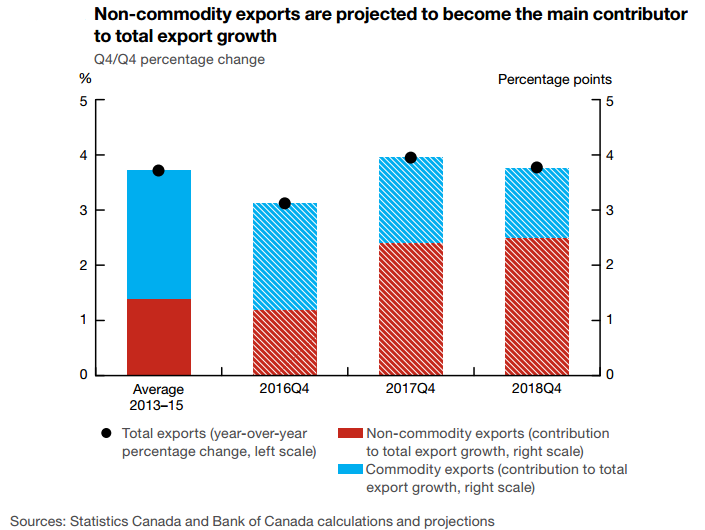 Still, the BOC is optimistic that “the past depreciation of the Canadian dollar and accommodative financial conditions” would encourage non-commodity exports to pick up, which would then encourage investment outside of the resource sector, so much so that the BOC projects that non-commodity exports are projected to be the main drivers for Canada’s export growth by Q4 2017. In the near-term, though, the shift away from the resource sector will continue to restrain Canada’s growth. In his opening statement for the BOC press conference, BOC Governor Stephen Poloz noted that the Loonie has “increased from its lows,” attributing the Loonie’s rise to higher oil prices, among others, but he opined that “most of the increase appears to be due to shifts in expectations about monetary policy in both the US and Canada,” referring to the U.S. Fed’s tightening cycle and speculation that the BOC is less likely to cut rates. Poloz then warned that “the combination of slower global and US growth, a new round of cuts to investment in Canada’s energy sector, and a stronger Canadian dollar would have meant a lower projected growth profile for the Canadian economy.” However, when he was asked if he was trying to jawbone the Loonie in a later interview, Poloz said that he wasn’t and he even added that he doesn’t have an agenda on the Loonie. Given the less favorable global economic growth, the decline in investments, and the strong Loonie, Poloz admitted that BOC officials “entered deliberations with a bias to easing policy further.” However, they held off on that bias because of the Canadian government’s fiscal stimulus, which is expected to create to create around 100,000 jobs in two years and boost Canada’s overall economic growth. 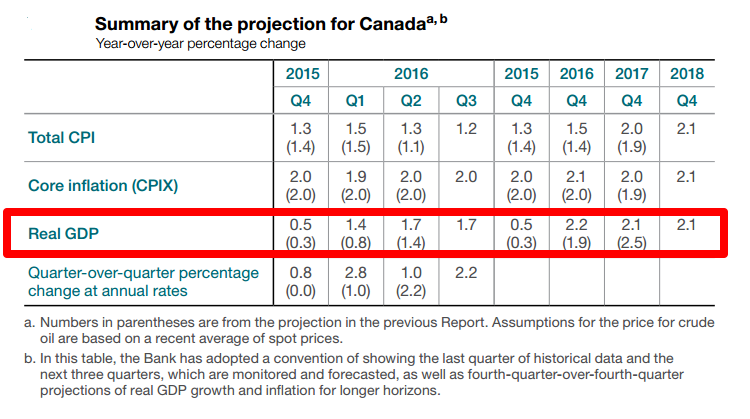 The fiscal stimulus, which includes a $120 billion (that’s in Loonie dollars, by the way) budget for infrastructure, among others, is the reason why the BOC upgraded its growth projection for Canada’s economy. Poloz still warned that the “global economy retains the capacity to disappoint further” and that “households’ reactions to the government’s fiscal measures will bear close monitoring.” Moreover, the BOC has “not yet seen concrete evidence of higher investment and strong firm creation.” Overall, a rather dovish tone, yeah? Forex traders loaded up on the Loonie as a knee-jerk reaction to the announcement that the BOC decided to keep the overnight rate steady. The Loonie party soon skidded to a halt, however, likely because the BOC’s official press release sounded rather cautious. The Loonie then proceeded to give back its gains when the BOC press conference went under way and the key points I mentioned above were discussed. And it probably didn’t help that oil prices were retreating at the time.